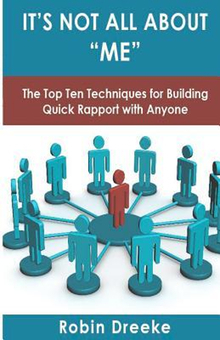 I’m not quite sure how I came across Robin Dreeke‘s It’s Not All About Me: Ten Techniques for Building Quick Rapport With Anyone but I’m glad I did. Robin is the lead instructor at the FBI’s Counterintelligence Training Center in all behavioral and interpersonal skills training. And he wrote an awesome book on how to master the skills of communication. The FBI process not only includes research into social and evolutionary psychology, but it’s been honed from years of field experience. I’ve been trying these out over the last few days and I’ve already noticed an improvement. Most importantly, I’ve put away my phone and focused on the person with whom I’m talking. This simple act of giving people my undivided attention has made a world of difference. There are not many places that teach these techniques and I couldn’t have asked for a better guide than Robin. I suspect you’ve sat in a bar at one point or another and been approached by a stranger who tried to start a conversation. My guess is you felt awkward or possibly even uncomfortable. This is because you didn’t know when or if the conversation would end. The first step in the process of developing great rapport and having great conversations is letting the other person know that there is an end in sight, and it is really close. When you approach someone to start a conversation most people assess the situation for threat before anything else. Humans have genetically survived because of this. This is a strong reason why these techniques work; they are specifically designed to lower the perceived risk to a stranger. This is a pretty simple one. You want to look non-threatening. The number one nonverbal technique to use to look more accommodating is to smile. This isn’t new. It’s the second of six principles in Dale Carnegie’s book, How to Win Friends and Influence People. You can, however, accentuate your smile in a subtle way. Adding a slight head tilt shows the other person that you have comfort with them and trust them. Another nonverbal to try and maintain is a slightly lower chin angle. High chin angles make someone feel like you’re looking down at them. Another key nonverbal is body angle. Standing toe to toe with someone else can be intimidating. A slight body angle or blade away from the individual you are engaging will present a much more accommodating nonverbal. How you shake hands matters too. An accommodating handshake is one that matches the strength of the other, and also takes more of a palm up angle. Speaking fast may mean you’re excited. It may even mean that you know what you’re talking about. However speaking slowly gives you more credibility. Whenever I have a conversation that I believe is important for me to be credible in my content, I purposely slow down the delivery and take pauses for people to absorb the content of what I have just said. If you’re like most people, you’ve felt a bit of regret for turning down someone seeking help. Think for a moment about the times in your life when you have either sought assistance or been asked to provide it. When the request is simple, of limited duration, and non-threatening, we are more inclined to accommodate the request. As human beings, we are biologically conditioned to accommodate requests for assistance. The compulsion is based upon the fact that our ancient ancestors knew that if they did not provide assistance when asked, the assistance would not be granted to them if requested at a later date. This may be the most rewarding and most difficult of all of Robin’s techniques. Suspending your ego is nothing more complex than putting other individuals’ wants, needs, and perceptions of reality ahead of your own. Most times, when two individuals engage in a conversation, each patiently waits for the other person to be done with whatever story he or she is telling. Then, the other person tells his or her own story, usually on a related topic and often times in an attempt to have a better and more interesting story. Individuals practicing good ego suspension would continue to encourage the other individual to talk about his or her story, neglecting their own need to share what they think is a great story. There are many types of validation. Robin identifies three of them. Listening. This is the simplest and one of the most effective. Just listen to someone can produce amazing results. Where we run into problems is keeping our own thoughts, ideas, and stories out of the conversation. “True validation coupled with ego suspension means that you have no story to offer, that you are there simply to hear theirs.” And there is another benefit. When the focus is on the other person and we’re not anxious to tell our own story, we also tend to remember the details. We’re mindful. Thoughtfulness “.. few people naturally use this to its fullest potential, and, most of the time, we don’t realize when it is being used; all we know is we really like the person who gives it.” Demonstrating thoughtfulness in words and actions with everyone in our lives is a simple and effective way to improve our relationships. Validate Thoughts and Opinions. This technique is quite difficult because of “our innate need to correct others and the difficulty we have suppressing our own egos.” But if you remember that we like people who are like us, you’ll immediately grasp the power of validating thoughts and opinions of others. The best way to get someone to do what you want them to do is to have them come up with the idea. And the best way to have them come up with your idea is, no surprise, to honestly understand the other person’s point of view and then build upon that base with your ideas. 7. Ask … How? When? Why? It’s hard to answer these questions with a simple yes or no. Once the individual being targeted in the conversation supplies more words and thoughts, a great conversationalist will utilize the content given and continue to ask open ended questions about the same content. The entire time, the individual being targeted is the one supplying the content of the conversation. This means suppressing your ego and listening to what people are saying. You’re not thinking about what you’re going to say next. You’re not thinking about how the person is wrong. If you’re really listening then asking open ended questions based on the content of what they are saying should be pretty easy. In the context of a conversation, this means giving up a little information about yourself in order to further the conversation and get a little from others. This is conversational reciprocation in action. Great rapport builders and conversationalists use this desire proactively during every conversation. This technique, coupled with ego suspension, are the cornerstones for building great relationships. This is also the easiest technique to utilize, because gifts come in many forms, from non-material compliments, to tangible material gifts. Gift giving, or reciprocal altruism, is hardwired in our genetics. The key is to do this without an agenda. If you have an agenda you’ll come across as insincere. Regardless of the situation, whether it is an altruistic intention or not, there is an agenda. The individuals in life that are able to either mask their agenda or shift the agenda to something altruistic will have great success at building rapport. The surest way to avoid disappointment is to lower expectations. If you’re looking to improve the connections you have with others, give it a read.